A late bloomer boomer's soft place to fall, and inspiration on how to get back up. When I was a little girl, my parents brought home a puppy. I'm not quite sure why they picked this particular puppy to bring home because neither of them had ever owned a dog before, and this was going to be a big one. 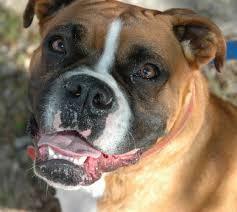 It was a boxer. Like all puppies, he jumped and chewed, barked and licked. No one in our house knew how to train him; therefore, no one ever did. The little puppy grew to be a big unruly dog who tried to please everyone and just didn't know how. I named him Happy which was a most appropriate name. Happy would see any distraction and go running after it. We constantly found ourselves chasing Happy. My parents built the fence outside higher and higher, but Happy kept jumping the fence to see what exciting things might be on the other side. At one point, they even put a stake in the ground and attached a chain to the dog so that he wouldn't continue to jump the fence. That worked until a neighbor called and told us that we had a live dog (thank God) hanging over our fence! The next day, I was told that Happy ran away. This was my parents' version of "we gave him away." There would be no more chasing Happy, no more of him trying to please us without knowing how, no more of his looking for something better on the other side. I missed him terribly. It was one of my first lessons in unhappiness. I've always adored dogs. In my adult life, I've never been without at least one. The only times I've ever known dogs to be unhappy is if they are in pain, missing someone they love, or trying to release themselves from confinement to get to someone they love who is missing. Aside from these three things, Happy, was exactly that ... Happy. We humans always seem to be looking for happiness. Either we had it and lost it, or we've been trying to get it. Sometimes, we have fleeting moments of happiness: the time we fell in love, when we got accepted to the college of our dreams, when we finally got the job, the raise, the promotion. But for the most part, it seems to me that everyone I know is constantly looking for happiness, but never finding it. What I've been trying to figure out, is why I've already found it and they haven't. Perhaps it's because I'm not in the pursuit of happiness. I'm simply happy. Perhaps the two things I believe most make me happy, are 1) knowing that I cannot change the things I cannot change and accepting that, and 2) knowing that if I help someone else to be happy, we will both be happy. Believe me, I don't live a charmed life. I have just as many problems as everyone else does. While I don't walk around ignoring them and burying my head in the sand, I do try to put the "bad stuff" in perspective and weigh it out against the "good stuff." I always let the good stuff win. Of course I have my pity parties. Of course I have days when everything seems to go wrong, but in the overall scheme of things, I'm pretty damn happy in the here and now. When I'm in pain, and I do have lots of physical pain from living with cancer for 20 years, I am admittedly unhappy. When I'm not surrounded by the people I love, I am admittedly unhappy. The rest of the time, I'm just plain happy right where I am. Like my dog Happy, I try to please those around me, but not to my own detriment. Like Happy, I'm happy just being pain-free and with those I love. I'm grateful for what I have. I believe I appreciate what I have, and I look forward to new experiences yet to come. Now that I'm all grown up and not that little girl who lost her dog, I'm no longer chasing Happy. I found it right where I am.